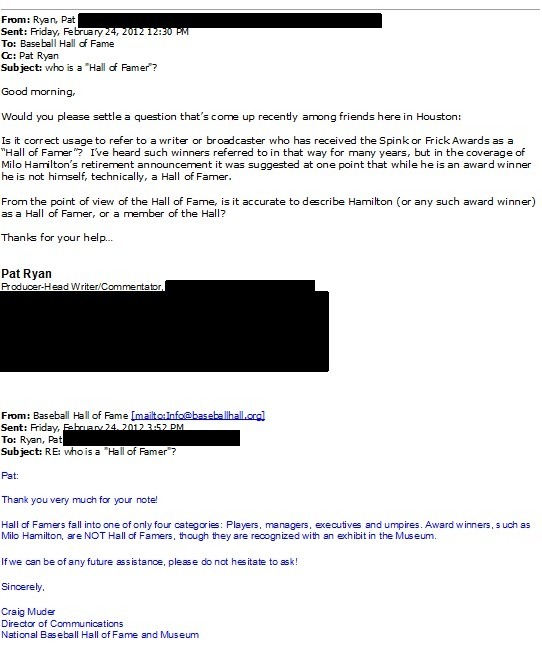 Milo, you’re no Hall of Famer and I can prove it – HEY, IT'S PAT RYAN'S BLOG! Listening to a baseball game on the radio is a special treat, but I haven’t been able to tune in to my Houston Astros since the mid-1980s because I cannot abide the play-by-play announcer. So I was quite pleased recently when Milo Hamilton announced he was retiring from the broadcast booth after the 2012 season. Appreciation of one broadcaster or another is to some degree a matter of taste, I grant you; in this case, I’m finally getting the bad taste out of my mouth after more than 30 years! In the days of my first experience with cable television in Austin, Texas in the late 1970s, when all you got was a dozen or so channels in total including the local stations, the special offerings including the independent “super stations” WTBS (originally WTCG) in Atlanta and WGN in Chicago which carried a ton of syndicated programming plus all the games of the Atlanta Braves and Chicago Cubs baseball teams. To a fledgling broadcaster and long-time baseball fan it was pretty cool to see how stations in other cities put on their broadcasts, and since the Cubs played all their home games in the afternoon back then I saw them a lot. In a very short time I decided that I did not care for the style of either of the Cubs play-by-play men, Harry Caray and Milo Hamilton. By 1985 I was back in Houston, and was disgusted at the news that the Astros hired Hamilton to be the second play-by-play guy behind long-time local favorite Gene Elston. By 1987 Elston was unceremoniously dumped and Hamilton had the top spot in the radio broadcast. He has some ardent fans—most notably Astros management, that hasn’t fired him in all these years—but Hamilton is the subject of high derision and ridicule, and it’s not just me: check out the comments forum at Houston’s Leading Information Source, or even the Astros’ own website, when the news broke that Hamilton was going to announce his retirement. There you have it boys and girls, the bar-bet-settling evidence straight from Cooperstown! Milo Hamilton, no matter which halls of fame you claim, you are not a member of baseball’s hall. Happy trails! Oh, frabjous rapture! So, I was relatively proud of myself for coming up with information that like-minded baseball lovers can appreciate. I shared it among a group of friends, and made the parenthetical aside that “this may be the most worthwhile thing I have done this week;” my friend Tom Adolph, no doubt voicing the sentiment shared by many others, replied “This may be the best thing you have ever done.” If so, I can live with that.